I kinda love being sick. When I'm healthy I tend to push myself too much. 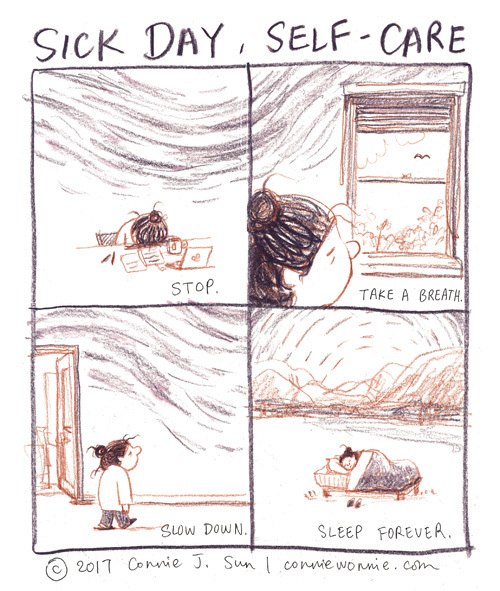 But when I'm sick I take time to recover, to take care of myself. Every few months I take a "bed day". I prepare food the night before, so I don't have to do anything but maybe make tea. I lie in bed reading and watching DVDs and just chilling. It's sad that in modern Japan, many office workers put in so much overtime living for the company that they spend all of their free time sleeping. Personal life? What's that?